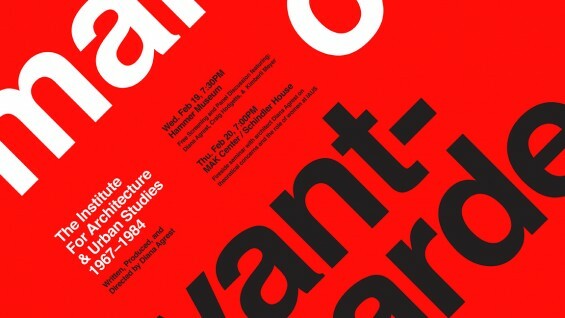 The Making of an Avant-Garde: The Institute for Architecture and Urban Studies, 1967–84, a 67-minute documentary film written, directed and produced by Diana Agrest debuted at the Museum of Modern Art in summer 2013 and was followed by a screening in The Great Hall of The Cooper Union. The film has since been screened at the Yale School of Architecture were it was the subject of a discussion between Yales's former members of the The Institute of Architecture and Urban Studies (IAUS): Peter Eisenman, Peggy Deamer, Deborah Berke, Alan Plattus and PhD students. The UCLA Hammer Museum will host a screening co-presented with the MAK Center for Art and Architecture and followed by a Q&A with Agrest. In conjunction with the screening, Agrest will give a talk addressing the theoretical concerns of the Institute and the role of women in its intellectual activities. The Institute for Architecture and Urban Studies, founded in 1967 with close ties to The Museum of Modern Art, made New York the global center for architectural debate and redefined architectural discourse in the United States. A place of immense energy and effervescence, its founders and participants were young and hardly known at the time but would ultimately shape architectural practice and theory for decades. Agrest's film documents and explores the Institute's fertile beginnings and enduring significance as a locus for the avant-garde. The film features Mark Wigley, Peter Eisenman, Diana Agrest, Charles Gwathmey, Mario Gandelsonas, Richard Meier, Kenneth Frampton, Barbara Jakobson, Frank Gehry, Anthony Vidler, Deborah Berke, Rem Koolhaas, Stan Allen, Suzanne Stephens, Bernard Tschumi, Joan Ockman, among others.